Had a lengthy call with Coach Riley today…man is he a dedicated and considerate guy. Calls me while he’s traveling in a monsoon heading out to a speaking event to talk about his second-most-favorite-topic (behind 9-month old daughter Sloan), his football team. The guy is just a ball coach (maybe, ‘the young ball coach’ will catch on). Loves to talk football. Is open about his players and philosophies…glad he is one of us. 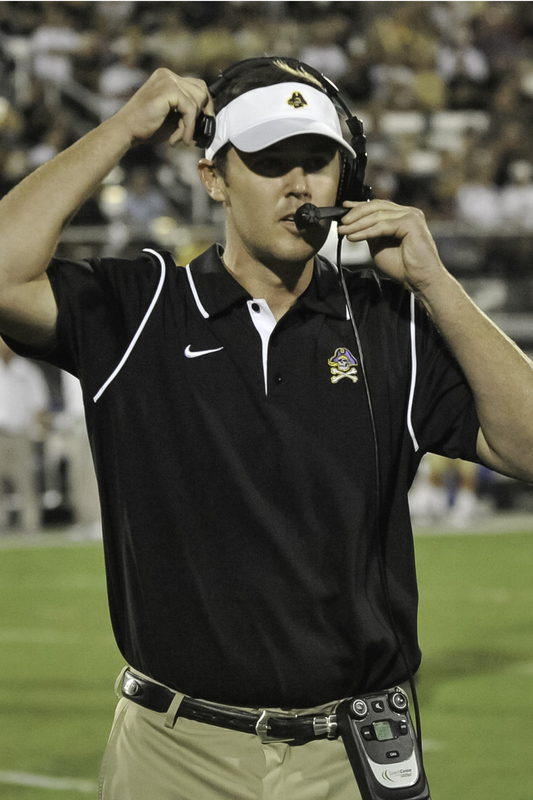 Riley talks Pirate O: Offensive Coordinator upbeat about depth and capability of this year’s team. Anyway, the interview is for a forthcoming pre-camp analysis piece for Bonesville coming out soon in which Riley breaks it all down in terms of what he thinks he has, who needs to step up, where he is concerned, and a few other nuggets. He is so open to questions that I have too much on the tape to cram into the analysis piece (I know…taking up space has never been a problem for me…half of you probably give up on a Pirate Time Machine by page 3 or 4). But, I wanted to share a few little snips and snaps from the conversation with Riley…not too much, but enough to make it worth taking this peek. Riley says this about his quarterbacks, in general…Shane can be much better than what he showed last year. Cody is starter-ready now and Shane better watch his back because he is hungry. Kurt has supreme skills and smarts. Ethan had a great camp. There will be 6 expected in fall camp. Coach noted that we should all keep an eye on redshirt junior, Yuba Community College transfer, wide receiver John Worthy…said he is a big-time play-maker and a player that Riley can’t wait to work more with in the fall. BTW…for the record, these were the types of things Riley said the first year he was here when I wanted to talk about Dwayne Harris and he kept saying, ‘Dwayne is great, but let’s talk about the walk-on, Justin Hardy…he’s going to be the greatest receiver to play here by the time he graduates.’ Well, if you are charting Hardy, Coach R seems to have been channeling the Amazing Kreskin. Seems to be hyped up about Worthy, too. Staying with the receivers, after a step backwards in 2012, Coach thinks Reese Wiggins is primed for a re-emergence, practicing and playing like he is on a mission. Great kid…love to see him reminding us of that sophomore season. Also underscored the sophomore transfer from Marshall, Bryce Williams, too, noting that he had one of the better spring camps on the team. Maybe a little bit of a flare sent Justin Jones’ way?? (Speculation on my part). Newsflash: If Tay Cooper can log more than a 1,000 yards playing roughly 10 games a year ago, just think what he can do this year. Consider that Coach Riley pulled no punches when asked what Coop has to do to build on last year. “Not trying to pick on him, but he really needs to improve in every thing out there.” Riley pointed to the fact that Coop, frankly, wasn’t in very good shape coming in last year and had little grasp on the system (how they want their backs to run the ball in the open field). He said that as nice as all those 10-12 yard rushes were, he expected more home runs from the athletic, former quarterback. Expect to see them this season as Cooper is in the best shape of his life and has been pushing hard to perfect each element of his game. And he will need to as Riley said that we shouldn’t be fooled by the thinness of the running back corps in the spring. There will be a lot of talent there this fall including JUCO AA Breon Allen, a healthy (finally) and determined Chris Hairston, and uber skilled true frosh Marquez Grayson getting his shot. And, oh yeah, the rumors that Hunter Furr’s career as a Pirate is over…premature. Yes, he is not on the roster right now, but Furr will be back in the thick of the backfield battle this fall (according to Coach R). Wide receiver is deep, but not the deepest unit according to Riley. No, for that, check the front five. Riley indicated that they learned in the first two years that you can never have enough hog mollys in the pig pen. From a do or die perspective, this is the year that the offense should really be able to role with four starting lineman that have tons of starting experience. A few OL tids and bits: Elsawi has flipped to right tackle where Riley said he is actually a better right tackle than left tackle; center is not only good, but deep again this season…keep an eye on JT Boyd’s growth at the position; Ike Harris, a natural left tackle, but don’t forget about Ryan Revia (boy is a man now); X-factor is Marquis Wallace…high talent, but won’t know what we have till he is in the gear; and finally, one to watch closely, Tre Robertson…put it this way…Will Simmons has someone he can mentor who gets the art of slob-knockery. That’s it…all I can divulge at this point. The actual piece for Bonesville has actual analysis, so please check that out when it runs. BTW, in case you didn’t know it already, a neat little Bonesville fact: you can get to the website also by going to www.gopirates.com. Thought some of you might like that better…easier to remember for some. RC, great article and I, as always, am very much looking forward to the magazine coming out. This is a very important year for this staff, for our school and for this football team. This is the season we as a fanbase have been pointing to since Coach Ruff came to ECU and it is vitally important that it be successful. 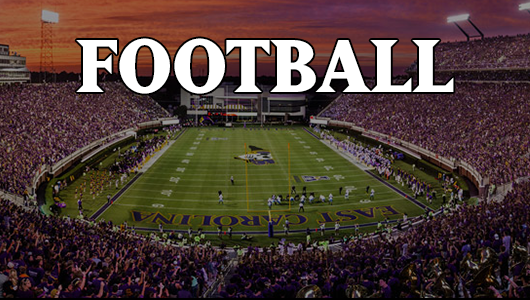 With all the things ECU is facing in college football – a new conference, and the possible split within Division 1 – it is critical that ECU’s public perception be raised. I think we have the coaching staff and the team to do, now we have to find out if that is true or if it is just a case of purple-tinted glasses. Thanks again for the article and the whole series of articles you put on this website. I agree with your thoughts on the importance of putting together a statement season NOW. Wherever that bar is set between the haves and have nots, we want to be north of it and this season could have major impact on that. Many thanks for your kind comments about this site…means a lot to me. I am trying really hard not to sip the purple kool-aid this year as it has only resulted in disappointment in years past. However its hard not to be excited about this offense. When I look at going into last years season, we talked about how deep we were at WR. I think if you really take the purple shades off, we werent as deep as we thought. Sure, Justin Hardy is the real deal, but I felt like he was the only “great” WR we had. We had some others that were good or ok, but not great. Who else would you feel comfortable throwing to on 4th and 10, needing to get a first down, with the game on the line (a la the Marshall game)? Bodie possibly. But beyond that you got a little nervous. I am looking to see if we have a few more weapons this year that you know we can really go to in pressure situations outside of Hardy. Keep it coming Ron! Love your stuff. Cant wait for the season to get started! Your point about perceived depth and proven depth a year ago is an important one. I think we will see more proven depth at WR this season. I think Webster and Wiggins will be much more reliable this season. I am a little baffled about Jones because he makes plays sometimes that show an ability to dominate, but then disappears. Hoping that Solomon doesn’t have a soph slump…he was pretty darn good last season. Great article from my favorite sports writer. It’s amazing what talent and passion can do combined. You have them both. Coby…truly means a lot to me coming from you. For anyone who is not aware or familiar with the Crossbones.com days, it must be stated that there is a good chance that this blog or Bonesville or BoneyardBanter – all things we all enjoy – wouldn’t even be here without your pioneering work. Anyway, I greatly appreciate the words, Coby. Good stuff Ron. Sounds like another exciting year and another great edition of the mag. Can’t wait for both! As far as wide receiver depth goes I thought Webster was getting better with each game. He should be fully recovered this year and a beast for defenses to cover. Hi Ralph…thanks for the drop in. I agree that Webster could have a special year. He can be so dangerous…that kid is a feather merchant, but he can take a hit and man, can he climb the ladder. I think we have serious threats at wide receiver. I respect Lincoln Riley being positive about his players, but as good as Justin Hardy is, and he’s got greatness, he does basically one thing at the highest level. Comparing him to Dwayne Harris at receiver, but all around Hardy has a long way to go. Is he close the the kick returner Dwayne was? No. Is he the blocker Dwayne was? No. Is he a guy you can hand off to as a running back? No. Justin Hardy is likely as good or better as a pure wideout than Dwayne, but as an all around player. No contest. It’s Dwayne Harris unless JH picks up all those things he currently isn’t. Hard to argue with you on that angle…Dwayne was a special, special guy. What impressed me about Lincoln Riley when it came to Justin Hardy was that he was so adamant that Hardy was a special receiver from day 1…which is so surprising given that Hardy was a walk-on. To see that in Hardy, IMO, is impressive and should Hardy stay through his senior campaign, he will likely have re-written the receiving record book with some pretty solid high marks. Dwayne…now he was truly a special player from all points of view, IMO. I so hope he rocks it in Dallas this season. Be sure to check out the American Digest section, some great links and nuggets about the AAC.